So many things you said I can relate to. When I read your bio, I was taken back to my teenage years in the 60’s. My life was a little different and I married young, but I felt a kinship to you as you described your young life and the hardships you experienced. I am also 72 born January 23, 1946, a real baby-boomer. I have 3 children, and 3 grandchildren. I feel you truly wanted the kind of life you chose. I think some of it was the hard way around but I think where you are is right. I watched your show and liked you a lot. You are someone to be proud of and I believe your relatives feel that. Continue on, my dear with your wonderful videos and recipes and excellent humor. Live long and laugh well. I will be your friendly, loyal audience. No your not! We’re two peas in a pod, saving things not just for ourselves but others that may need something we have. We need to create a list of these things and post it to a sharing site! It prolly started with our grand parents. I’m pretty sure my saving things came from a few of mine. We should all make videos on how to repurpose items. There is just too much waste in this world. Our parents and older generations used everything forever. They didn’t live in disposal cultures as we do. I take care of my belongings and end up donating many items to the Goodwill or other charities, or give them to others who would like them. My mother and her co-workers would swap children’s clothing (aka hand me downs). I would love when she would bring me home a package. The dresses were gorgeous. Now there are upscale resale shops that have finally got the message that, yeah, people will pay big money for those valuable hand-me-downs. LOL. I think it’s a thing that happens to all of us as we age. I see i5 in my parents house are both in their early 80’s and my grandmother before she passed. I’m trying really hard to be strong, lol. nope i’m an aries and toss everything that isn’t nailed down except photos and a few mementos or items of sentimental value such as old jewelry from my grandmothers, that and old plates which i use on my walls so i can enjoy them everyday! I always try to find 2nd and 3rd uses for everything! Recycle, recycle, recycle! yes i try to recycle too if it’s practical and not too tacky looking. otherwise i put in recycle bin. i used to get rid of a lot of things on http://www.freecycle.org. look up your area! Use your sweet bear jars for granola gifts! Give them away. Fill them with the making for cookies and give them away…. Make simple syrup and reuse for moistening your cake. Fill them with sand and use them as a door stop…. Fill with dish soap and get a smile each time you do the dishes. I am just like you.I have magazines called spree which has beautiful recipes and things to do, like sewing, crafts, etc. I just love cook books.and just books, material and other things, I am trying to clean out my closets, by giving away some of my books and other things to change charity. 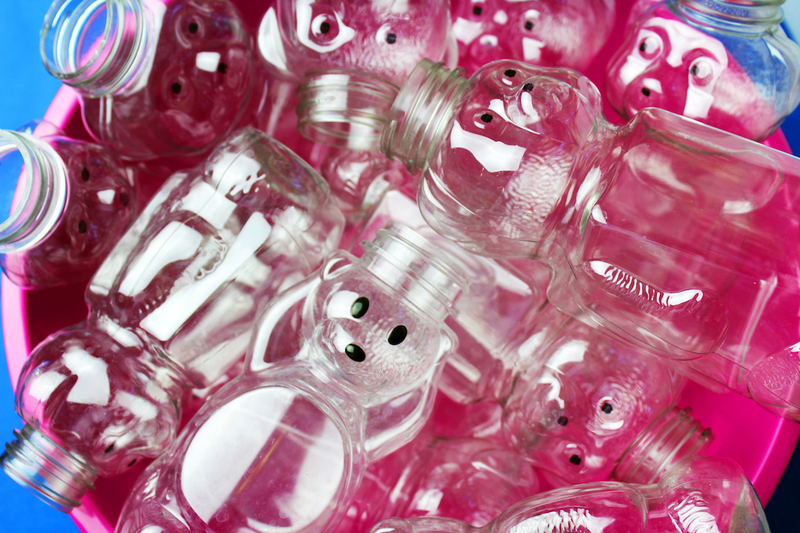 Those bear honey jars would make an adorable light string, perhaps using clear Christmas lights. You’d probably have to cut out the bottom to let the heat out. How awesome a bear light string would look in your kitchen! Miss your recipe videos. Hope you can come back soon!